Kit Cornell. Bowl, 2016. Porcelain, Exeter clay glaze. Reduction fired to Cone 10. 4 x 8 in. Photo by Jacques Cornell. 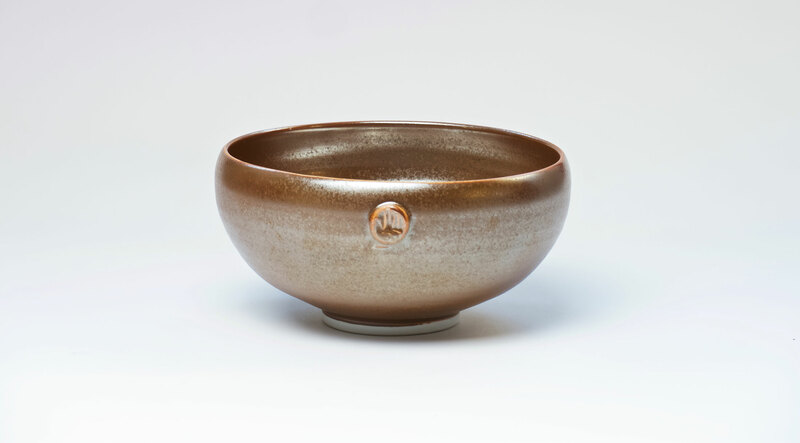 I began making wheel-thrown pottery when I moved to Exeter, New Hampshire, in the early seventies, a time when crafts were burgeoning in the state. I have no real idea what drew me to the medium. Perhaps it was collecting the shards of imported fine porcelain I found on a hillside in the Virgin Islands, where I grew up, or being stunned by the beauty of the Japanese tea bowl I saw at the Freer Gallery in Washington, D.C., when I was in college, or being given a Sevres vase during my year in Paris as a young mother. Nevertheless, pursuing pottery was a satisfying path. I took my first class at the local craft center. I am a visual and tactile person, not naturally coordinated. It took me many weeks to learn how to center. Using my body in an organized way was a great experience, and hand-building never particularly interested me. The rhythm and challenge of working with clay on a spinning wheel, the physicality of it, was and remains appealing. My mind and hands were engaged in a meaningful occupation. I was challenged. On the wheel, I felt the clay’s responsiveness to my touch, and as it took form, I knew then that I had found my professional focus. I began and continue to make pieces for daily use, functional work, affordable work, for people like me. Can with our art compare. As I developed as a potter—slowly, while raising a family—I became aware that women in other developed western countries had access to state-sponsored child care and other modes of support for making career and family life sustainable. Also, pay equity was (and continues to be) a problem. The potter Jane Kaufman made clay coins in the seventies that had “59 cents” stamped on them . . . what a woman earned in relation to each dollar earned by a man. Teaching in my studio, doing short-term residencies in various schools under the auspices of the New Hampshire State Arts Council, and making my own pots filled my work days. In my free time, reading books and articles on ceramics and craft, poetry, and current affairs, provided me with fodder for conversation with family, students, and friends. Throughout the seventies, sighties, and nineties, free or affordable workshops were great sources of learning and community. 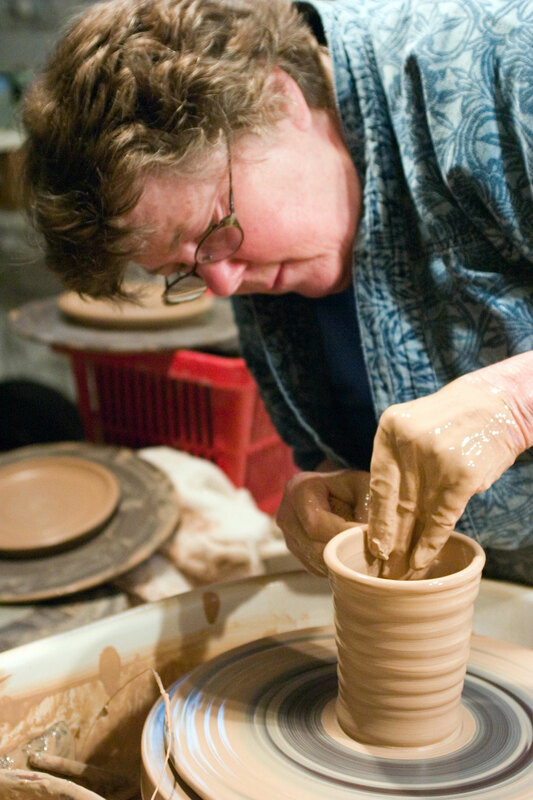 At one, I met Clary Illian, a magnificent potter from Ely, Iowa. Her elegant forms attracted me, as did her understated mien and extensive knowledge of the field. Magdalene Odundo of Farnham, England, taught pit firing one summer at one of the Phoenix Workshops in Dunbarton, New Hampshire. In a memorable two-week workshop with Elspeth Woody, we made huge clay forms for a college campus installation. 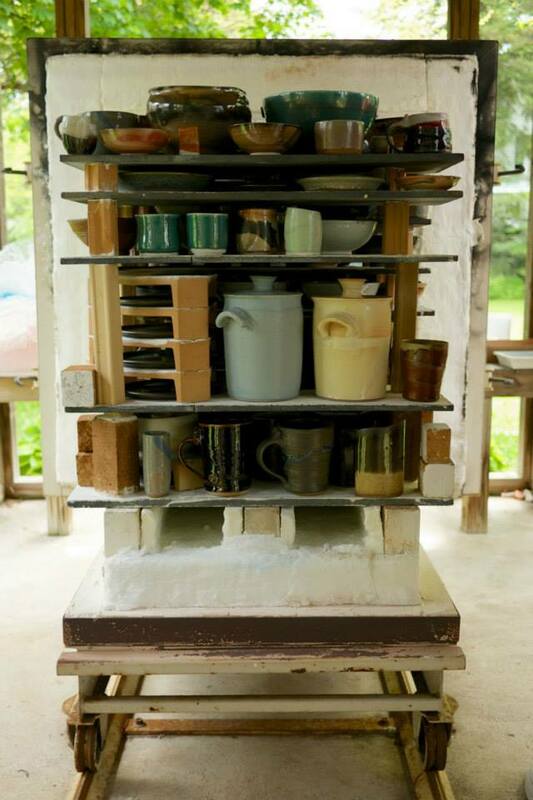 In another, Mary Rohm constructed a wood-fire kiln and oversaw its first firing. I remember that on my watch the fire stalled, and I asked Mary whether to stoke with more or less wood. Her answer: “Try one way and if it doesn’t work, try the other.” To this day, her advice serves me well in many situations. Early in my career, I discovered Studio Potter magazine, met its founders Gerry Williams and Peter Sabin, and would have taken the $200 lifetime membership they offered at the time, had I had the money. I volunteered to make recordings of the magazine articles for the blind, which were put on cassettes and distributed. 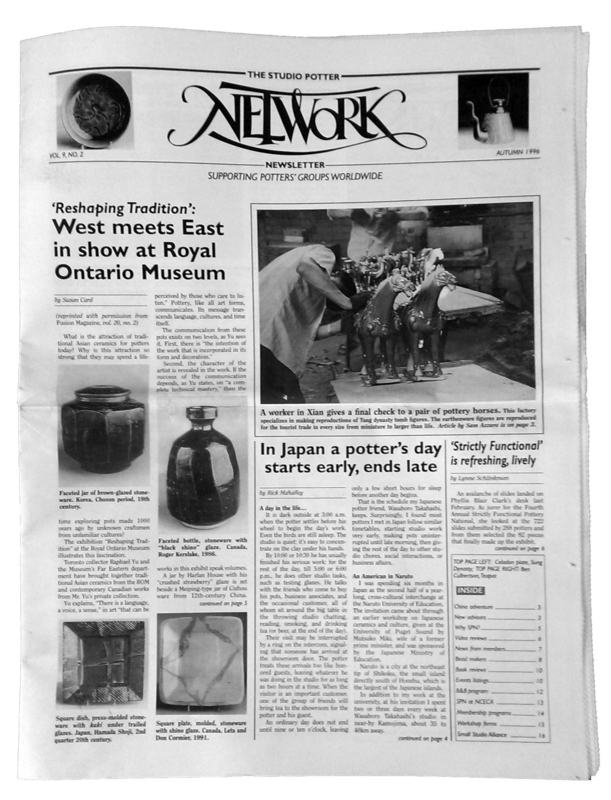 Then I helped launch the Studio Potter Network Newsletter, whose purpose was to connect potters’ organizations worldwide, encouraging interaction and mutual aid. We published twice a year. A bed-and-breakfast network was a component that many enjoyed, including me—I drove from Calgary to Vancouver, visiting potters all the way. After half a dozen years with Studio Potter, I returned to my studio full-time, and began offering apprenticeships and studio assistantships. 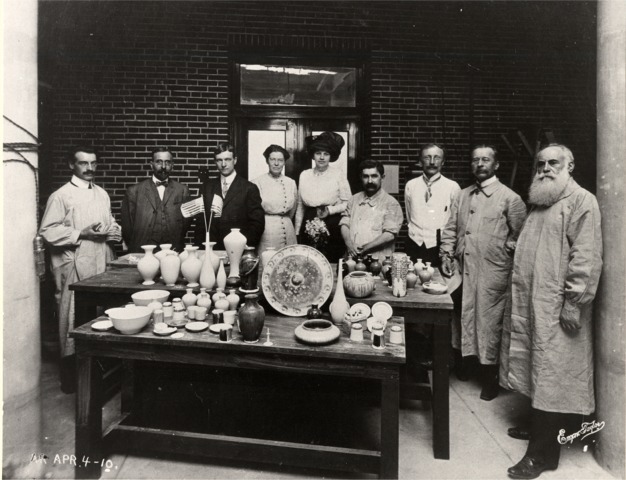 In most of my life as a potter, men were generally afforded special attention, and women were given less significant roles. When I saw Judy Chicago’s Dinner Party at the Boston Center for the Arts in 1980, I was blown away, and returned to my studio with a lot to ponder. It was time for me to look more deeply into my studio work. My great-grandmother had been an accomplished decorator of bone china cups and saucers as well as an ardent women’s rights activist in the Twenties. Had she never contemplated making the objects themselves? Could she have? What were the social mores that would have made it difficult? In my growing library of ceramics books, I learned that Adelaide Alsop Robineau, who lived in Missouri in the early 1900s, made her pieces from start to finish—unusual for a woman at that time. 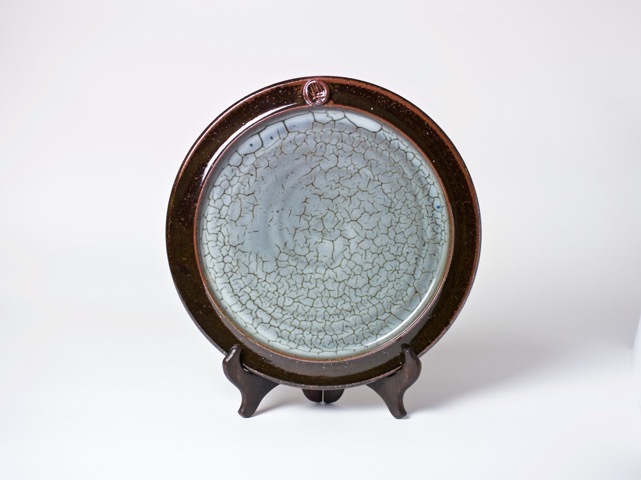 She worked with noted French potter and glaze specialist Taxile Doat, who worked many years at Sèvres in Paris, before coming to the U.S. to teach at the University City Pottery in St. Louis. His book, Grand Feu Ceramics, I first read in French. 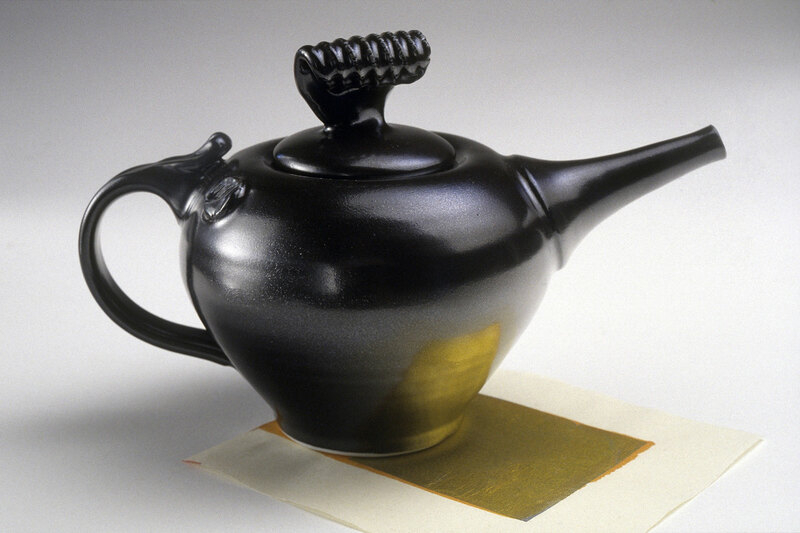 I spent years learning from Doat’s approach to clay and glazes, and his understanding of surface and body. He felt that the artist must be his or her own chemist, gaining harmony and homogeneity from research. His support of Robineau and her independent approach to her craft was inspiring to me. I then sought the out-of-print ceramics notebook of British potter Katherine Pleydell Bouverie, which I found at the Victoria and Albert Museum in London, and copied. From it, I learned about the unique qualities of natural wood ash: the chemical makeup of woods, choosing, burning, and processing techniques. I learned about developing glazes using the ash’s special qualities and experimented, making endless test tiles—oak, maple, beech, pear, and mixed ashes. My ultimate favorite, applewood ash, was gathered by the owners of a nearby orchard for me from the burning of bough trimmings in spring. “Apple Annie’s” became one of my most unique and delightful glazes. Using local materials helps me feel personally connected to my community and its natural resources. I continued, as time went on, to question women’s roles, and my role in my craft. I read Moira Vincentelli’s Women and Ceramics, Gendered Vessels, which I found illuminating. Vincentelli indicated that in the ceramics field, as in society generally, women were looked at differently from men, and women deal with discrimination that is largely culturally constructed. Her writing in this and other publications fueled my determination to work for equal opportunity and justice for women. At the NCECA conference in 1991, I attended an extended workshop entitled “How We Get Empowered If We Don’t Play the Game,” led by Marge Levy, which resulted in the following goals: developing women’s voices through alternative language, redefining “the game” so it is in accordance with women’s values, and developing the willingness to take political action. The progress that has been made by and for women since I began my work in clay, one person and one vessel at a time, is heartening. There is more to do, and it is work I am committed to doing. Using the skills she's developed over decades, Kit Cornell is involved in mentoring, teaching, research and arts activism—ways she contributes to the flourishing of the craft arts, and leads others in embracing the future and finding their place in it.